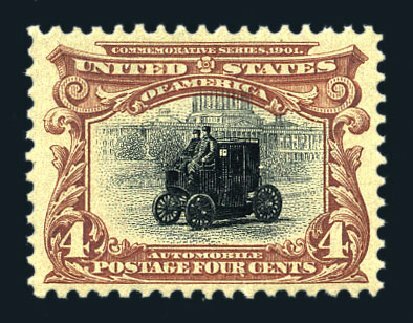 USA (Scott 296) 1901 PAN-AMERICAN 4¢ DEEP RED BROWN & BLACK, ‘LOW CAR’ Used example with car well into frame below, small faults, fine appearance. Vignette shifts are scarce on the 4¢. U.S.; General Issues, 1901, 4¢ Pan-American, #296, n.h., great color, Extremely Fine, PF (2004) cert. Scott $170. Estimate value $240-300. 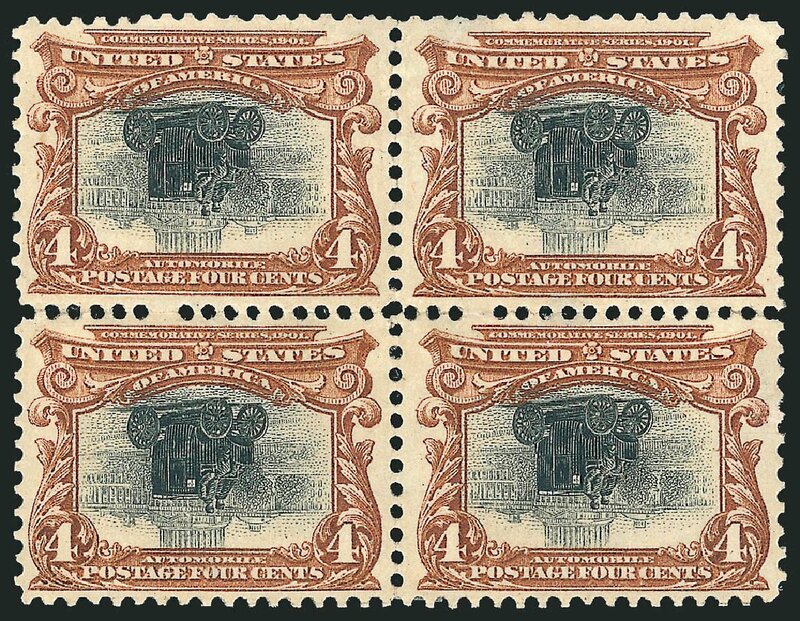 / U.S.; General Issues, 1901, 4¢ Pan-American, Block of 4, #296, 2 l.h. (top), 2 n.h., Very Fine. Scott $480. Estimate value $200-250. U.S.; General Issues, 1901, 4¢ Pan-American, #296, n.h., Grade 90 Extremely Fine, PF (2014) cert. 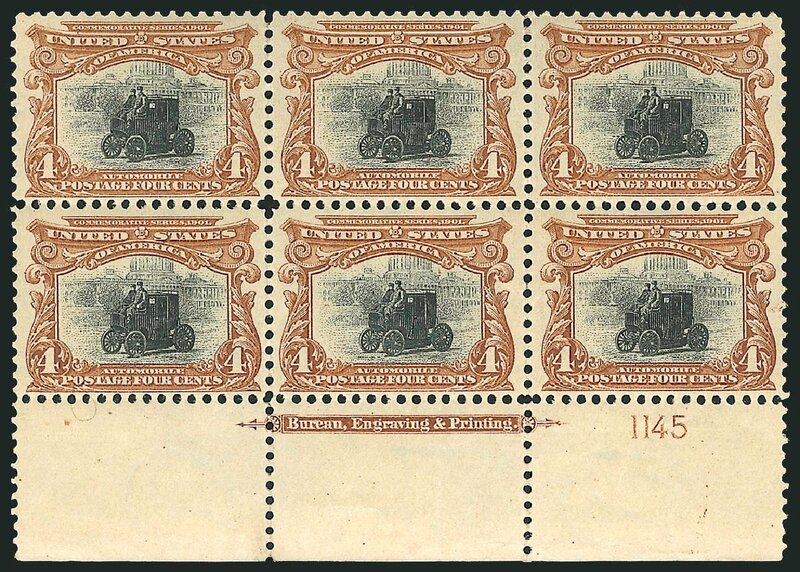 Scott Stamp Values $340. Estimate price $200-230. U.S.; General Issues, 1901, 4¢ Pan-American, #296, n.h., Very Fine, PF (2005) cert. Scott $170. Estimate price $70-90. 1901, 4¢ Pan-American (Scott 296), o.g., never hinged, impressive well centered example with deep rich color, plus the stamp shows a dramatic vignette shift way to the top left port of the stamp, Extremely Fine. Scott $170. Estimate value $150 – 200. 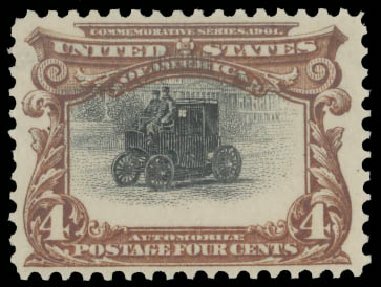 United States 1901 Pan-American Exposition Issue 1901 4c deep red brown and black, top margin plate number block of six, n.h., one stamp with natural gum inclusion, fine-v.f. 4c Pan-American, Center Inverted, Specimen Overprint (Scott 296aS). Clear strike of “Specimen” handstamp reading down at left, with plate no. 1145 and portion of plate letter imprint in black at bottom (from the left pane), h.r. in selvage only, warm rich color, completely sound FINE. 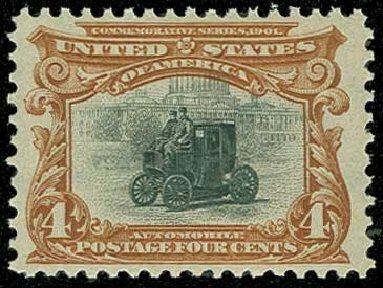 ONE OF FOUR RECORDED PLATE NUMBER AND PLATE LETTER SINGLES OF THE 4-CENT PAN-AMERICAN INVERT. 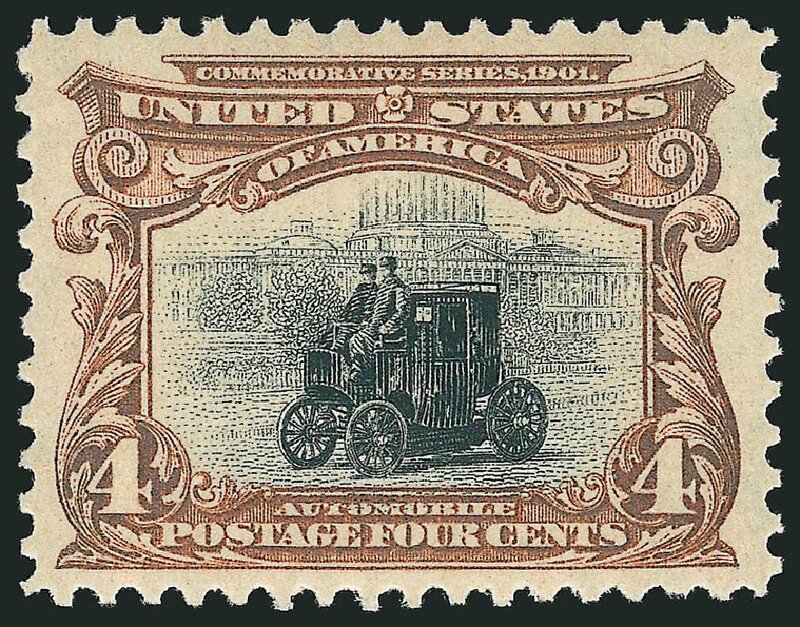 ONLY THIS EXAMPLE HAS THE “SPECIMEN” OVERPRINT. The production and distribution of the 4c Pan-American Invert occurred under extraordinary circumstances. 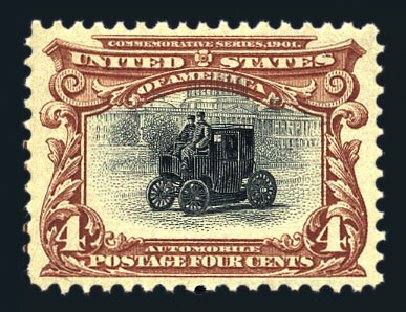 After the 1c and 2c Inverts were discovered, rumors of a 4c Invert caused the Post Office Department to order a special printing of 4c Inverts to retain as specimens. It was reported that two sheets of 200 were printed, for a total of 400 stamps; however, as we shall describe further on, at least four plate impressions were made. It appears that only the lower halves of the sheets were finished with gum and perforations. 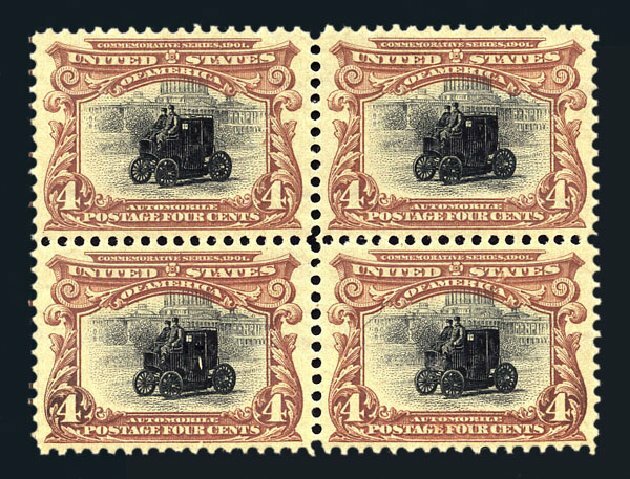 If the reported quantities are correct, 203 4c Inverts were released with or without the small “Specimen” overprint. 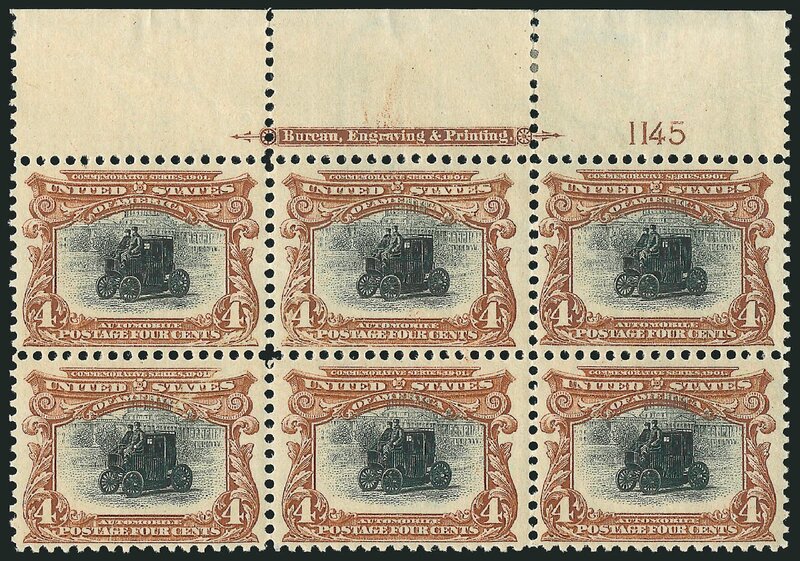 Some examples, both with and without the overprint, were given away by Third Asst. Postmaster General Edwin C. Madden. When postal authorities learned of the practice, they destroyed 194 copies and put one pane of 100 into the official archives. At a later date, 97 of these were traded for rarities missing from the archives. We have been studying this fascinating Invert “Special Printing” for several years and have recorded imprint and plate number examples of the 4c Pan-American Invert from the bottoms of four different sheets of 100, each comprising left and right panes of 50 (six of the eight panes are represented by at least one bottom-margin position). The sequence of vignette plate letters in the bottom selvage, which were normally printed in the top selvage, can be used to identify Left or Right pane positions. These letters were applied each time the vignette plate was used, and the 4c Invert has the longest sequence of letters we can find on any 4c Pan-American, presumably because the plate was used for the last time to make the Invert “Special Printing” after the regular stamps were printed. 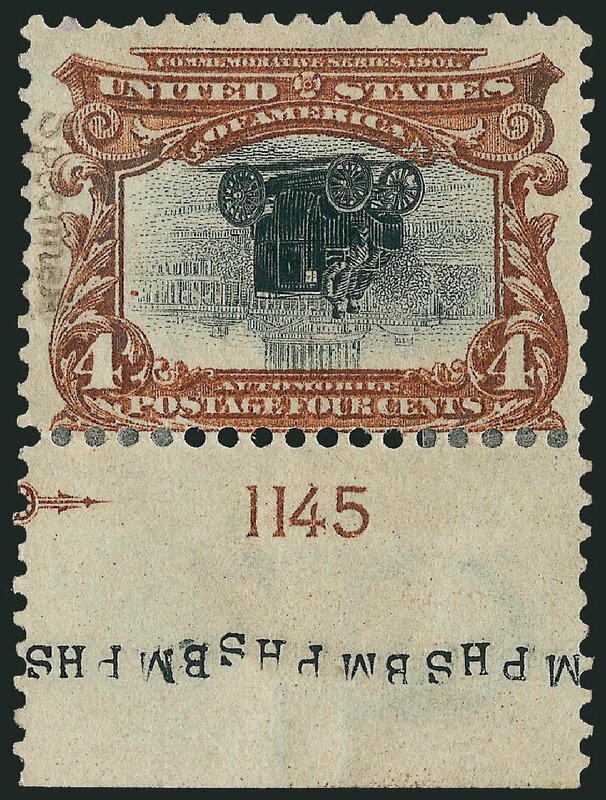 There are at least 48 separate entries of the two or three-letter initials on the 4c Invert vignette plate. For the purpose of identification, we will refer to these four sheets as S1, S2, S3 and S4 (Left/Right for each). From S1 Left we record three singles with plate letters and the unique plate block of four with the imprint and plate number. 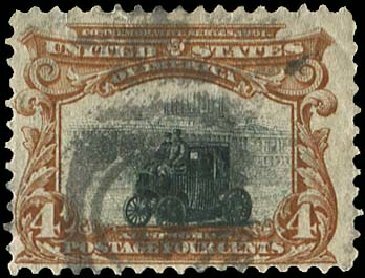 None of the S1 Left imprint stamps have a “Specimen” overprint. From S1 Right we record the imprint and plate number strip of four sold in the Cunliffe auction by Spink-Shreves. It, too, does not have a “Specimen” overprint. 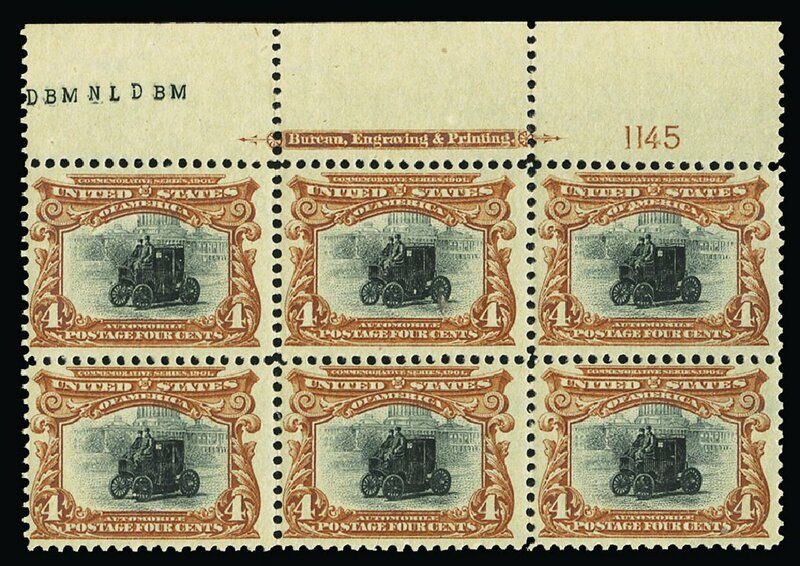 From S2 we record only one imprint and plate number single, from the Right pane and without overprint, ex Odeneal (Siegel Sale 941, lot 1207). 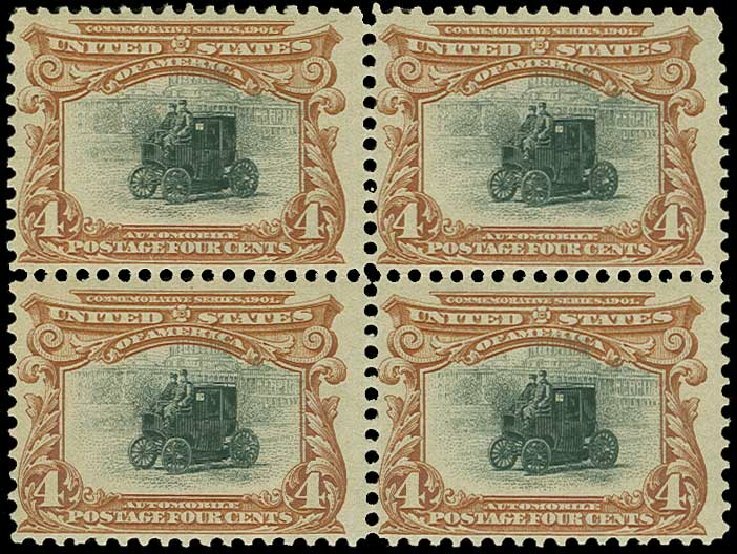 From S3 we record an imprint and plate number single from the Left pane (Siegel Sale 745, lot 717) and another from the Right pane, neither with overprint. Finally, from S4 we record the imprint and plate number single offered here, from the Left pane and with “Specimen” overprint, ex Green and Cunliffe. Ex Colonel Green and Cunliffe. With 1996 P.F. and 2009 P.S.E. certificates. 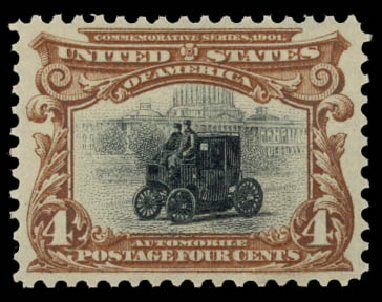 1901, 4¢ Pan-American (Scott 296), o.g., never hinged, fabulous mint example with beautiful centering and gorgeous rich color, Extremely Fine, 2015 P.F. certificate graded XF-90. Scott Stamp Values $340 in the grade of XF-90. Scott $160. Estimate $250 – 350.